Connect with mountain, fusion in mountain. 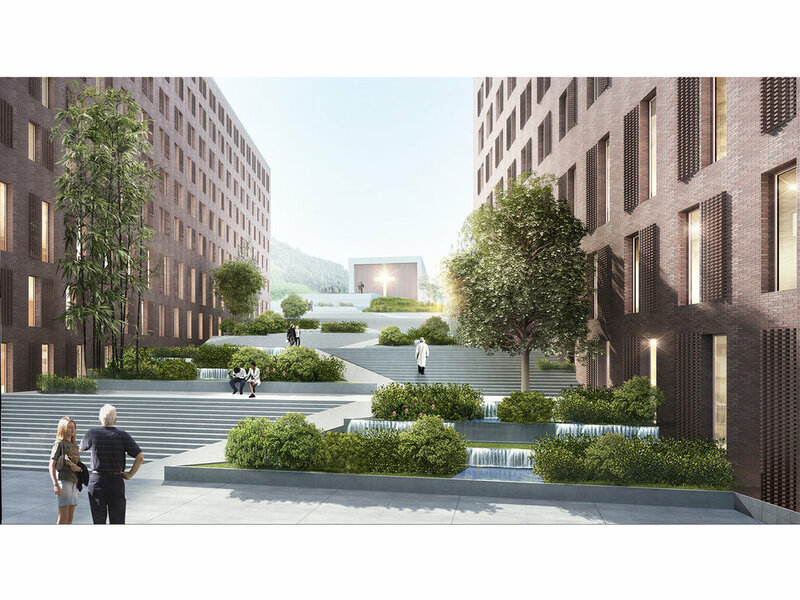 With landscaping architecture way, profit the difference of the site mountain’s topography; bring the greenness of the mountain into the future hospital’s courtyard and roof garden. Bring the mountain and hospital together. Changsha as a city rich of rain, each centimeter of sunshine is precious. All ward rooms are oriented toward the south, profiting the best sunshine and ventilation. Numerous daylight boxes bring lights, wind and gardens into interior space. F1 Outpatient/Emergency, F2: Medtech, F3 Doctor Pool. Floors above are all wards. At F1 and F2, The main north/south axis of patient at the west side of the hospital connects all patients’ flow of the hospital. At the end of east side, the main axis connects all staffs of the hospital of F1 and F2. Plus, at F3, the doctor pool connects all staffs of the hospital. 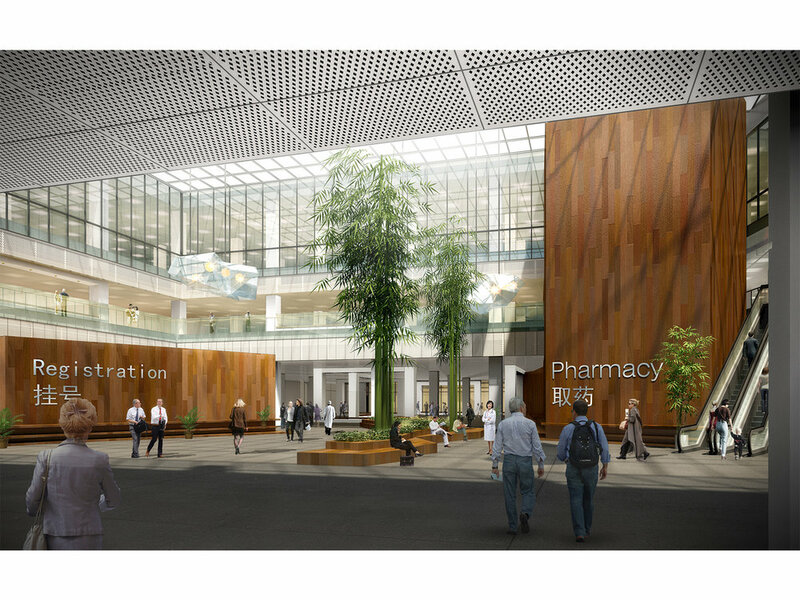 Inpatients and their companions can benefit from the services in this central Inpatient platform (3dplan), from registration/fee, flower shop, boutiques, banks, gallery to coiffeur, laundry, bookstore, cafe, restaurants etc. From here, patients and their companions can reach easily to each ward’s floor and imaging center. Even during the hard waiting time for the operation, anxious family members can have a tea break and loose him into the beautiful view from the east mountain. Outpatients access the common services in the central outpatient hall, getting registrations, paying the fee, taking the medicine, measuring temperature, making the blood test. They could also choose to get into the eastern mountain and take a promenade round. The Medtech Area connects every parts of the whole hospital. Patients for operation are transported from each ward, through the doctor’s lifts situated at the middle or east of each ward block, to the F2, and they are transported through the eastern corridor (doctor corridor) to reach directly the operation area. ICU areas situated at F2 and F3 are also directly connected to the operation area and imaging area. The Doctor pool at F3 is the “hub” of all hospital staffs. The whole hospital including the expansion part in phase 2 is designed as one connected rainless and barrier free space. This guaranties the usage even during the worst weather. Duo-dimensional module of 8.1m based on 1.35m grid, gives an enlarged possibility for all medical usage requests and economic parking. This makes possible the hospital’s function’s growing and adjustment. It’s a typical scenario driven methodology. Beside sunny global plan and respiratory courtyards, double wall system control the energy lost to the minimum. On the top roof, the installations for hiding the roof machines are also used as supporter of sun energy sheets. Energy reserves and recyclers make the building even more energy saving. Esthetic of red bricks from the Xiangya’s tradition is kept here and even being developed. Those several courtyards lying in the eastern mountain, seems meditating about the history and the future of XiangYa hospital.